During his April 9 Fox News show, Sean Hannity criticized Omar, referring to the “just unearthed” video. Describing the video as “unearthed” might give the impression that there was an attempt to hide it, but it was actually posted on YouTube , and Fox News even streamed it live on Facebook . In addition to being undercut by the context of the event, their argument against Omar’s speech is further demolished when you consider that President Donald Trump has a history of referring to terrorists as “losers ” -- which Fox News defended at the time . The one real point they might have is that she misstated when CAIR was founded. The organization was founded in 1994, not after the 9/11 attacks. 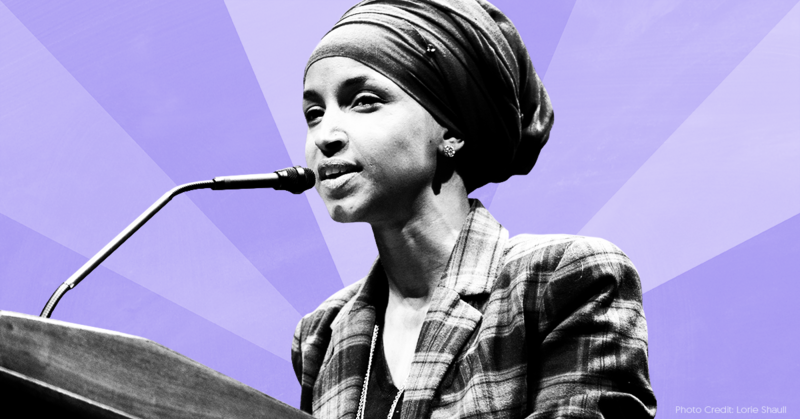 Update (4/11/19): Right-wing media continued their anti-Omar pile-on into the evening and morning after this piece was originally published. During the April 10 edition of Fox Business’ Lou Dobbs Tonight , Dobbs and guest Tammy Bruce laid into Omar for the “some people did something” line. On April 11, the New York Post  published a front page story based on the distorted comment accompanied by a photo of one of the planes crashing into the World Trade Center and the headline “Here’s your something.” This, again, doesn’t fairly reflect what she said. This is a smear campaign. @nypost  cover, below. For context, click this WP link. It shows Omar used the word "some" to distinguish terrorists from "all" Muslims. In February, a Coast Guard lieutenant named Christopher Paul Hasson  was arrested on drug and gun charges, and prosecutors found that he had been creating a hit list of prominent Democrats and journalists to attack. Omar was among the names. In early April, a Trump supporter named Patrick W. Carlineo  was arrested for threatening to assassinate Omar.